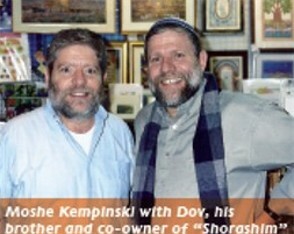 Growing up, Moshe recalls hearing the shoemaker’s story. People would come to the shoemaker with shoes that needed repair. And this wise man would talk and listen as he worked, unerringly uncovering and discovering a need. And he would mend both the troubled soul and the broken sole. “The shop is a safe place, a welcoming place where we all have the opportunity to talk… not to argue. There is no agenda here. I’m not out to convince anyone of anything.” Moshe wants to help visiting Christians “understand our understanding of what Judaism is about. I want to share what we know and perhaps help them see some things they don’t know.” Discourse is not limited to the theological; the shop talk often turns to the political and practical, as Moshe explains his views on the so-called peace process, the Expulsion from Gaza and introduces Christians to the pioneering communities of Judea and Samaria. The shop is so much more than another Judaica store. Everything sold in the shop—every piece of artwork and jewelry, each book– is Torah- based—has a connection and inspiration from the Scriptures. On sale at the shop are Moshe’s two books for the Christian audience: “The Teacher and the Preacher” and “The Heart of the People”, which answer questions about verses in the Scriptures and offer ways for Christians and Jews to join together by focusing on their mutual faith.